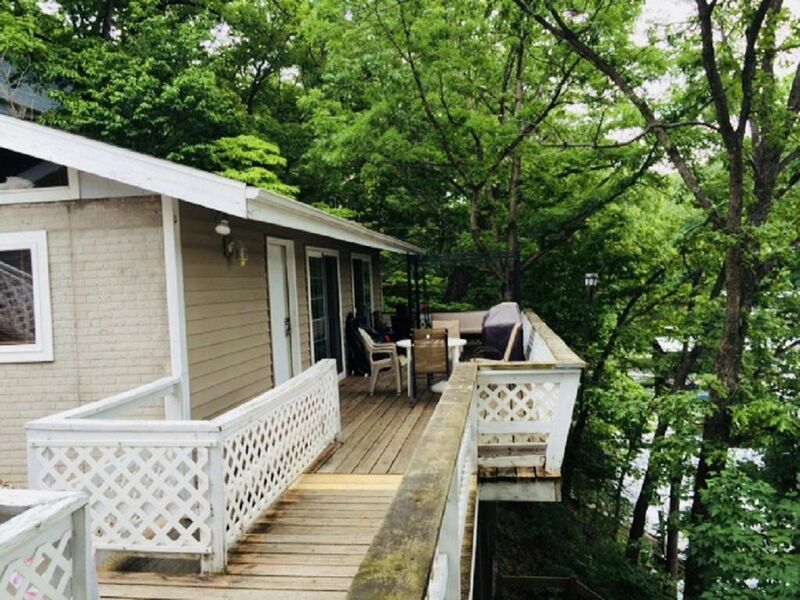 Cute Lakefront Duplex $300 per night off season Mon-Thursday last minute deal! Have the best of both worlds: Be together and have privacy when you want it! Cute 4 bedroom 2 bath lakefront duplex with 2 kitchens and large decks! Right on the water, dock with swim dock attached, boat slip available... close to restaurants, outlet mall, Shady Gators, go carts, and the Bagnel Dam Strip. Hey! My name is Chris. I am a retired educator, and used to be a High School Principal! My wife and partner is a retired educator/speech therapist. We are honest and friendly, and we want you to enjoy your vacation with us! Flexibility and affordable. Vacation together and yet allows for some privacy when desired. Right on the water... swim and fish from your own sets of docks...good deep water cove... safe for swimming and floating no wake cove! There were 11 of us in our group and this place handled our crowd perfectly. There was plenty of shade on the deck for the 90+ degree days and the dock and boat slip worked out great for swimming and fishing. Town was only a few minutes away for the supply runs or even going out for dinner and drinks, would recommend staying here. Thanks for being great Guests! Outlet Mall, Bagnel Dam strip, Go-carts, Putt-Putt Golf, Numerous Golf Courses, Restaurants(near Blue Heron, Baxters, JB Hooks), Boat rentals,near All the Action if you want it! Guests bring their own towels, sheets, and pillow cases.